At TIVC, we strive to provide a comfortable, calm and peaceful environment for you and your pet during their healing. It is for that reason we do not offer certain services such as surgery, hospitalization, radiographs, emergency care, boarding or grooming. We feel it is important for our clients to maintain or establish a relationship with a local veterinarian who provides these services if needed and routine care if we are not available. 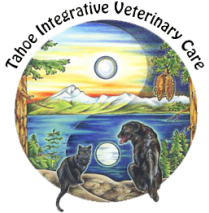 North Lake Tahoe, Truckee Veterinarian Dr. Robinson will gladly work with your regular veterinarian to provide an overall healing approach with services that best suits the needs of your pet. If you have an emergency situation with your pet which requires urgent medical attention, please call one of the facilities listed.